The Stop Whistle so far: In our previous stop whistle article, we looked at teaching the dog the meaning of the whistle. 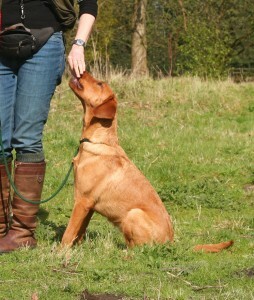 I described how to teach a dog to sit to the whistle, whilst at your side, with no other cues. The exercises were very simple. There were no distractions, no movement on your part or his, and no distance between you and the dog. Each of these three factors influence the difficulty of the exercise. Before we introduce an element of distance between you and the dog, we need to get him used to the concept of dropping into a sit from a run. [wp_ad_camp_1]This is not natural to a dog. By the end of this ‘lesson’ you are going to be able to run with your dog at heel, and have him drop into a sit whilst you keep going. It is important that he learns to sit even though you are still moving. This ensures that he is dropping to the sound of the whistle, and not just relying on the fact that you have stopped as his cue. If you do this exercise without careful preparation, your dog will probably run after you. I should say at this point, that many, if not most, gundog trainers teach this skill with some degree of punishment. From a verbal rebuke, to a lead check, to scruffing and reseating. If you use this method and break this process into small steps, you will be able to succeed with a minimum of corrections. But what if the dog gets up as you step forwards? This is quite common to begin with, even if your dog is reliable on the sit/stay after a verbal sit signal. All you need to do is make the exercise a little easier. If progress is slow, you may be tempted to correct the dog for moving. That is entirely up to you. But, the dog must sit to the whistle alone without reminders, or corrections, before you move on to exercise 2. Remember that you are less likely to need corrections if you give the dog rewards that he values for sitting still. Blow the sit whistle and drop the lead as you do so. DONT’ stop. Just as in 1c above, if a dog has a tendency to move at this stage, I may give a verbal SIT reminder, not to follow me as I step away. Do a couple of these, then try again without the reminder. If you wish to correct the dog for moving, a brief sideways lead check immediately after the whistle can hasten things along, but there is a lot going on what with blowing the whistle, looking at the dog, and stepping forwards. You need to have very good timing to get an effective correction into this sequence. I find that most dogs do not need correcting at this point, when you break things down this way. The most common handler mistake at this point is failing to eliminate the pause. The handler pauses, albeit almost imperceptibly, and the dog remains seated because of this pause. When they start to move faster and the pause disappears, the dog may follow them. Make sure you are not pausing at all before moving on. 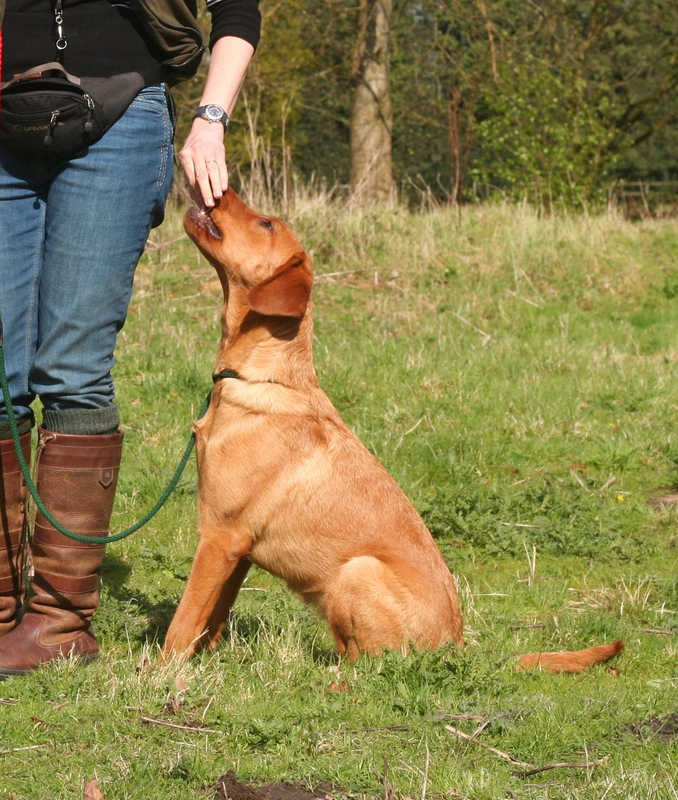 If your dog will sit to the whistle whilst walking along at heel, and remain there even as you walk away without pausing, you are ready to move on and speed things up. What if the dog gets up? Go back and make the exercise easier. Practice EXERCISE 2 a few times. Then try EXERCISE 3 again but build up speed more slowly. Take a few days over this if necessary, it is worth getting this right. Exercise four is very simple. Repeat exercises 1 to 3 without a lead on the dog. You have successfully completed this part of the training when you can run along with the dog at heel, off lead, and he will drop neatly into a ‘sit’ each time you blow your whistle whilst you run on away from him without pausing. At this point I usually add in a few simple distractions by sometimes jogging around the dog in a circle, sometimes running straight past him as I return. Just to ensure that he is solid on that sit after hearing the whistle. Thank you for this article this is one area that I as a first time bird dog trainer have sort of hit a brick wall. I have an 11 month old Golden Retriever he has serious drive to hunt and retrieve and will stop on a whistle close to me every time but when he’s been cast out for a retrieve he gets tunnel vision and won’t stop for anything until he brings the retrieve back. I started to use a chain control collar and check cord but honestly I dont want to use that negative of an approach because so far all of our training has been positive reinforcement without the use of E-Collars or check cords. I’m glad I found your method and I look forward to working with my pup on stopping at distance using your ideas. Thank you! This is really helping with my training problem. He’s doing so well now after just a few weeks of sticking with it. Hi Pippa. I’m enjoying working through the exercises with my 8 month puppy. I’m just wondering what the purpose of blowing the stop whistle a second time before returning to the dog is? What sort of time scale are we looking at for this exercise? providing the pup will do the first segment ok? Hi Pippa, Time restraints mean I very often have to train both my dogs together. I know this is not ideal but any advice would be great. Hi Peter, you will need to train each dog separately. I don’t know of any way around this. I have a number of dogs out with me at any one time, but each is trained individually and added to the group when ready. As far as I know, this is how other trainers cope with multiple dogs too. Thanks Pippa, Will try to do this at least once every day. Hi Pippa, I have just completed this exercise with my 6month lab, and it went really well. When can we expect the next instalment ? ?